Every year, more and more people are visiting the Pest and Buda quays of the Danube to experience the wonderful visual experience that is the highlight of our birthday celebration. Every year, the fireworks create exciting visuals for both foreign and domestic visitors alike. Thousands of rockets are flying high enough to paint colorful motifs to the sky. Almost every year, since 1927, the fireworks festival was held on August 20th on the feast of St. Stephen. This year more than 500,000 people are waiting for the event, as this time, unlike the tradition, organizers are preparing for a three-day long program, in order to accommodate a much larger crowd. For those who want to experience the fireworks in a more intimate environment, it is a great alternative to book a cruise ship on the Danube. 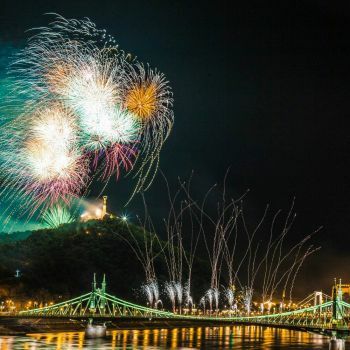 This year's fireworks will be fired from barges as well as from the Chain Bridge, which is beautifully visible, while enjoying a pleasant drink on the deck of the cruise ship. Anyone who has been on the Danube already has certainly felt that the city has various faces as the day goes on and the lights change. However, Buda and Pest are both the most beautiful in the evening. The city's lights and the historic buildings offer a spectacular view, so it's not just a fireworks simply that is worth looking at, but they together proved a splendid view. Whether it is a small family gathering, a party with friends or a romantic dinner, it is a great way to celebrate the most important holiday in Hungary. Aboard you can watch the program from the first line together with people who would also like to admire the fireworks of the 20th of August in Budapest.